What can the Airwheel SR5 self-following suitcase do for you? Abstract: With years of research and development, Airwheel has good feedback on quality and has good experience in product design. 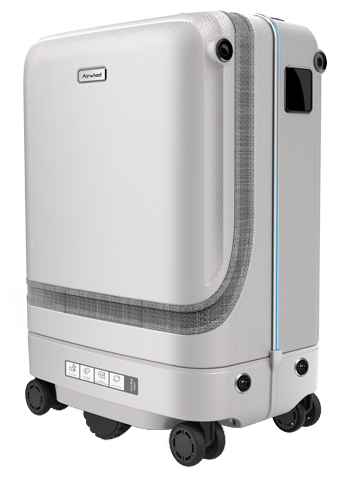 This time Airwheel designed this kind of smart robot suitcase to make your journey full of fun. Airwheel SR5 is a maximum size carry on with minimalist design with durable 360-degree spinner wheels, interior category compartments for a think-free packing experience, integrated packing checklist, and oh it's extremely light, just 4.5kg. Other specific parameters are as follows. Its dimensions (wheel included) are 550mm x 380mmx 210mm (L x W x T). The volume is 30L and its material chooses ABS + PC (it shares both the advantages of PC's excellent heat and impact resistance and ABS's anti-wear and anti-scratch.) The carry on size of SR5 hands-free suitcase meets international and domestic requirements and the interior category compartments (separated zipper pocket + maintenance pocket + energy storage pocket) are able to make your travel necessities in clean order. The 100% aluminum telescoping handle has three lock positions. The push button handle is scratch and stain resistant for enhanced comfort. SR5 features a spacious main compartment with an integrated TSA approved lock and comes equipped with an app controlled, 48.8Wh battery bank. The power bank is capable of simultaneously charging USB-C and USB devices, transforming every terminal, station or port into a personal power hub. Conveniently charge the SR5 smart autonomous suitcase battery pack with your MacBook's USB-C charger and included a long USB-C to USB-C cable. Stay Connected. More importantly, Airwheel SR5 intelligent self-driving suitcase knows your location by using its camera and by pairing with your smartphone via Bluetooth. Users can also remotely lock the bag or set it to auto-lock in case you get separated from it. It promises obstacle avoidance, has an anti-theft alarm, and follows you automatically. Yet a self-moving suitcase could be a blessing in times when your hands are full. For able-bodied people, such a device might be frivolous, especially at that price. But it could be essential for the elderly or physically disabled who find lugging a bag an ordeal. Go explore with the next generation of travel, Airwheel SR5.